Come to Me spell kit has me make an 8pointed star with the powder the first day. Are you suppose to redo the star every day or attempt to keep the powder formed like a star and hidden away some place so you can use it the next 7 days? Is it ok to clean up the powder every night..save it in the disposal container that I am suppose to bury and redo the powder-star every evening until the work is done? Is it a big deal if the star is pretty wonky looking? It's the 5th image down on the right hand side of the page. Moat people would leave it out on the altar for all seven days -- but if you must hide it, then re-make it each time. Wow, wish I'd seen that when I did my Come to Me spell-- but it was one of the first LM things I did and I didn't know what I was doing at all yet, didn't have an icnense burner or candleholders or anything! Yeah I was a mess the first day! I had pill bottle caps for candle holders - yeh, that didn't work out so well. I left the paper around the incense cones. I can't for the life of me figure out how those perfect incense cones are formed. Mine always fall apart! My first 8 pointed star was miserable looking. Then oil got in the powder and it looked like barbie barfed on my tray! The next day my candle holders arrived and my life got a whole lot easier without having to do the candle balancing act. I think I got sprinkling the star down pretty good now. I need a bigger tray. The one I have is the top of one of those breakfast in bed trays but it's pretty cramped. I want something bigger -- anybody have any ideas where to get a BIG tray? I tried making candle holders with tin foil-- a suggestion from the LM store. It didn't work that great because it was hard to keep them flat and the candles fell over a lot. Now before I would do a spell I would be much more careful that I had everything ready. I didn't even have an incense burner! My star was pitiful too. Oh yes, once I ordered those life was MUCH MUCH better! I didn't know I needed them the first time so was making do. It was funny! I also have a nice LM incense burner too these days. A friend of mine does this with a large pizza cooking sheet. She said it works quite well. Anyone have advice on how to draw with sachet powders? 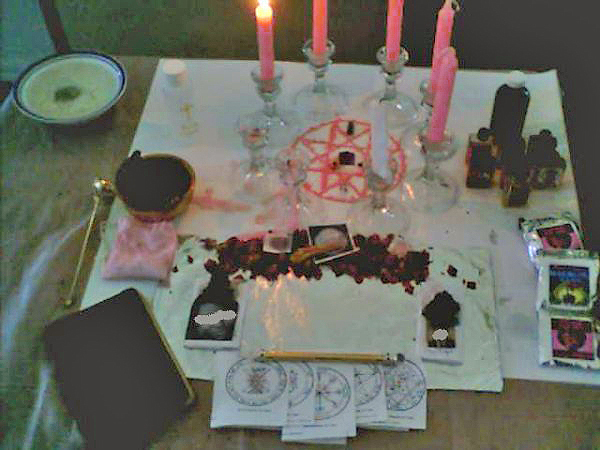 I have the Come To Me spell kit and drawing the star is giving me trouble. Any tips would be great! I remember seeing a picture of the set-up, and If anyone can point me in the right direction for that as well, I'd appreciate it! If you are having trouble drawing a star, then simply print one out, or do it to the best of your ability. It does not need to be perfect. I understand what the star is supposed to look like, but working with the powder (for me) seems kind of difficult. I was wondering if anyone had some tips on how to manipulate the powder itself. For it, it just seems to turn into a big (but wonderfully fragrant) mess! Not being sure how the spell is set out, can you dip your finger in the packet as needed to draw the star? Or possibly sprinkle some like you would flour when baking and draw the star that way? I tried that, it just made a mess- just like flour. I'm wondering if I can smooth out a pile of the powder on a small plate (with a slight rim) to keep the powder somewhat contained, then draw the star "in" the powder, instead of "with" the powder. Does that make sense? It may take a bit more powder to do it that way, though. Any thoughts? Click the link then enter in the "search" box the "Working with Powders"
You can learn so much from this wonderful resource. Thanks, Miss Tammie, that is great information. I suppose it just takes practice, trial and error to get the hang of using the powder. Mine seems to stick together, even though I store it with dessicant in an air-tight container, and I live in the desert with very little humidity. I'll keep trying. Thanks, all. The important thing is powder + star. How you get them together is less crucial. 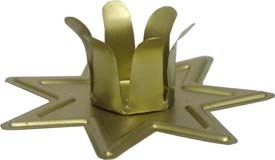 You could, as you suggested yourself, draw a star in a layer of powder; or draw or print out a star on paper and sprinkle it with powder: or do like Tibetan Buddhist monks do when making sand paintings, and improvise a chak-pur -- a slim metal funnel (theirs are specially made and have a ribbed exterior, which they rub with a metal rod; the vibration causes the powder to dribble out in a neat line). Just google "chak-pur," and "video buddhist sand painting mandala" to see them in use. You might be able to fill a small funnel or cake decorating tip with the powder and stir it with a toothpick to keep it loose enough to trickle out. Mojo Bag for love in a Star by Dr. Johannes. Spirit Trap in a Spiral by ConjureMan Ali. Skull for Uncrossing in a Triangle by Dr. Johannes. Come To Me love spell in a Star by Dr. Kioni. 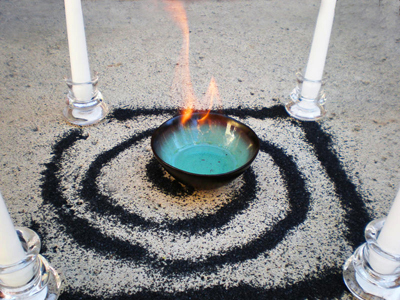 Uncrossing-and-Reversing spell for a couple in an Oval by Dr. E.
Thanks for sharing the pictures Miss Cat. Oh, thank you Miss Cat- the pictures are wonderful and inspiring. Now I really can't wait for my next shippment of LM supplies. And thank you Miss Michaele for the great ideas. I'm going to see what I can come up with- the cake decorating funnel idea sounds like just the thing if I can't get ahold of a chak-pur. Brilliant! I can't wait to try it. There are a variety of ways that you can do this. Sometimes I use a spoon and lightly tap the powder out in the designs I need--this has worked rather well and allows me to shape the "messier" spots while deep in Spirit. Another option is to use Incense powders which are often easier to use to trace out more complicated patterns. I've found this helpful when I've had to trace out kabbalistic seals which are rather intricate. I like the suggestion of using the incense to draw with. The texture seems perfect for that. Have you tired mixing the sachet powder with the incense to draw with? I am thinking of trying that. Thanks for the idea! Just order several kinds of sachets powders and I'm looking forward to working with them. Seeing the pictures were very helpful Miss Cat. and always the info and suggestions are great! How many candles should I use for a heart shaped pattern? I'm guessing four of them, one on the two upper curves, one on the inward point, and one on the point at the bottom. And is nine candles the proper amount to use any time you use a circle (I saw that was the number Dr. Johannes used in that link)? 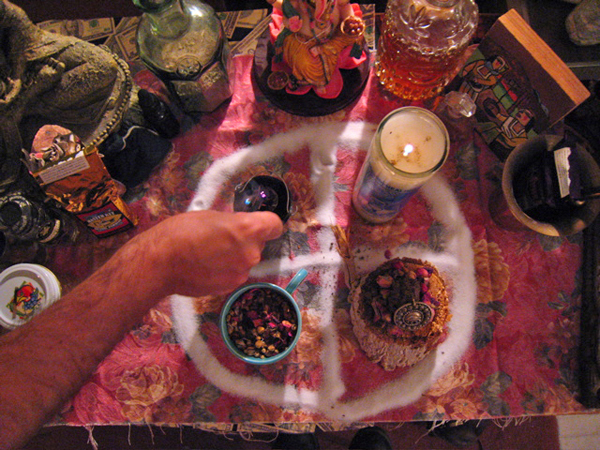 It is traditional in Hoodoo for some people to favor odd numbers. 7 candles are great number for love. 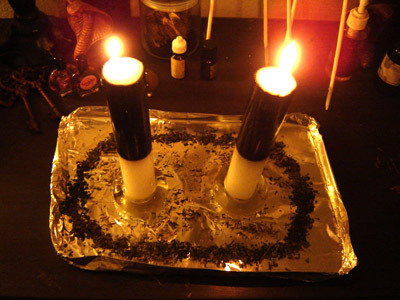 Other use 9 candles. And, yes, 9 is good for circles too. Thanks Miss Aida. I'll use seven candles for the heart and 9 for the Protection spell. Regarding the idea that the use of odd numbers forms some sort of defining tradition in hoodoo: This is not true. 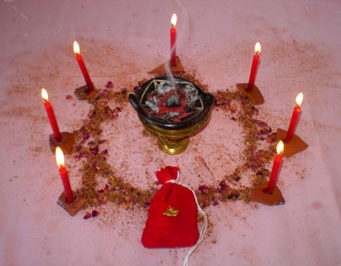 The number 4 is used in hoodoo among many practitioners, especially those who are of Native American descent. In this photo, which features the work of Prof. Charles Porterfield, we see that he had laid out graveyard dirt from the graves of four different ancestors, all of whom were buried in one family graveyard. The dirt was then scribed in the form of a crossroads. 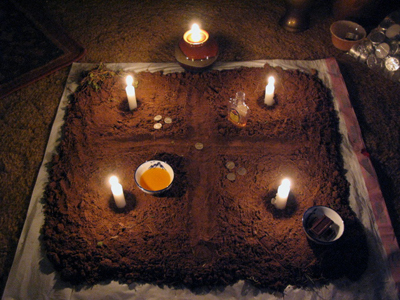 The four candles defined the territories or graves of each of the four ancestors, and each area contained individual offerings: a cup of tea, a bowl of chocolate squares, a mini-bottle of whiskey, and coins. 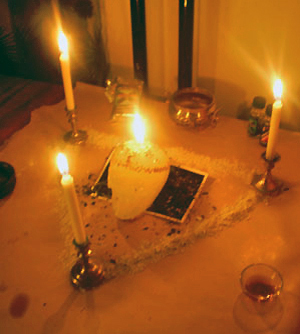 A fifth candle -- not part of the 4-candle ancestor array -- marked the way forward or the outcome of the work.